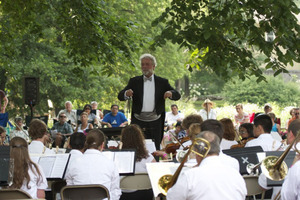 Valley Academy and Philharmonic will perform its annual American Pops Summer Symphony Concert on Sun., June 28th at 4:30pm at the Peg Bond Pavilion. As an added bonus, the Fox Valley Academy’s ensembles will also present a “Pre-Concert” performance of American folk tunes at 4:00pm in the Pavilion. The Philharmonic welcomes back the mayors of Aurora, Batavia, Geneva, and St. Charles to conduct the American classic, Stars and Stripes Forever. Residents of all Fox Valley towns are encouraged to attend the concert and cast their votes for their favorite Fox Valley mayor. The winner takes home the coveted “Golden Baton Award”. The performance will also include a medley of the Armed Forces Service tunes in which the Philharmonic invites veterans, and family members in the audience to stand and be recognized for proudly serving our country. Bring a picnic dinner, lawn chairs or a blanket. Admission is free, but donations are welcomed. 151 North Island Avenue, Batavia. 630-476-9072, FVacademy.org.